2-in-1 Melrose Pub Table that flips from a gathering table to a poker table top. Table features a two-toned finish with a Sable top and Mocha base. 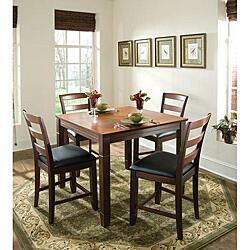 Comes complete with four Melrose slat back chairs with black leatherette seating. Set includes table and 4 chairs.